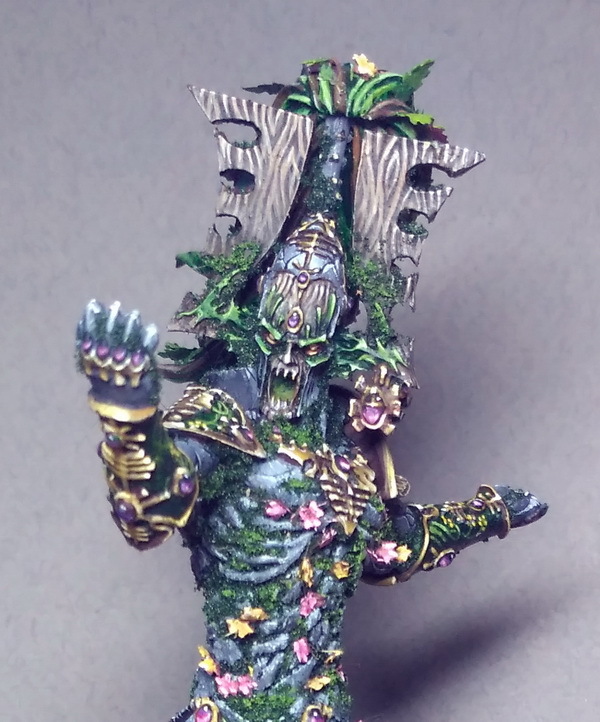 I've painted two more Eldar minis in the "forest eldar" theme as a company for Exodite Avatar. And they are - Farseer on bike and old little metal Warlock. Interesting idea, thanks again for Peter, and pleasure process as rusult. This is short story of birth of my another favourite project in 2017. It's an Eldar Avatar painted with non-standard color scheme. "The idea is to have the Avatar come out of the lore if the exodite Eldar. The exodites saw the destructive path the Eldar were going down, and left to start new worlds before the downfall. Eventually the eldars extreme decadence brought about the birth of the chaos god slaanesh who destroyed most of the Eldar, that's why there are so few left. The exodites colonized planets many light years away, and there lifestyle became very agricultural and simple. The exodites are characterized by very verdant themes with lots of natural growth and flowers, as the exodites live in very lush, green societies. My idea is that they still worship the Eldar god khaine, but that when he manifests as an Avatar for the exodites, he doesn't appear as molten fiery rock anymore, but rather an explosion of life and nature. I'm imagining a model defined by beautiful overgrowths of nature, with flowers, bursts of green and even wood. " Morrigan with full set of optional weapon is ready. P.S. I'm sorry for bad quality ща the final pictures. There was something wrong with my eyes or patiens, I don't know. No focus, wrong colors... But this is all I have... (. Now I want to tell short story about one of my non-standard project in 2017. It was commission for Eldar Wraithknight. I've painted one before in interesting color scheme (Cicero), but I didn't want to do the same second time. So, listing associations and images inside my head I've got an image of Morrigan. I decided to use all this info to create my new Wraithknight. Hi! My name is Nadya and I live in Moscow, Russia.